Moscow says it would postpone further payments of the promised $15 billion loan to Kiev and is waiting to see the direction of the newly formed government, according to President Putin and Prime Minister Medvedev. President Vladimir Putin assured Ukraine they can count on the promised $15 billion in loans from Russia, but the money will only be available once a new government is formed. “Let’s wait for the new Ukrainian government to be formed,” President Putin said in Brussels on Wednesday, responding to Prime Minister Dmitry Medevedev’s comment that Russia would wait on the emerging political situation in Kiev. Medvedev proposed Russia postpones the loan until “we understand what sort of government there will be, who will be working in it, and what rules they will stick to”. Medvedev’s concern was mainly fueled by the country’s inability to make regular payments for natural gas. “Even under the lower [gas] price they are telling us that they can’t pay. This really changes the situation,” Medvedev said. Meanwhile, Ukraine’s new interim prime minister said he expects Russia to deliver on the next $2 billion installment “very soon”, as Cabinet Ministers are expecting them by the end of January, and earlier this week already agreed to issuing $2 billion of its Eurobonds for Russia. Prime Minister Nikolay Azarov bowed out of his post hoping to quell the increasingly violent street protests in Kiev and elsewhere in Ukraine. President Viktor Yanukovich is currently in hospital being treated for fever and cold symptoms, according to the President’s press service. When will the next installment be? Speaking in Brussels at the EU-Russia summit, President Putin said Ukraine will receive aid regardless of who takes power, even if it’s the opposition. 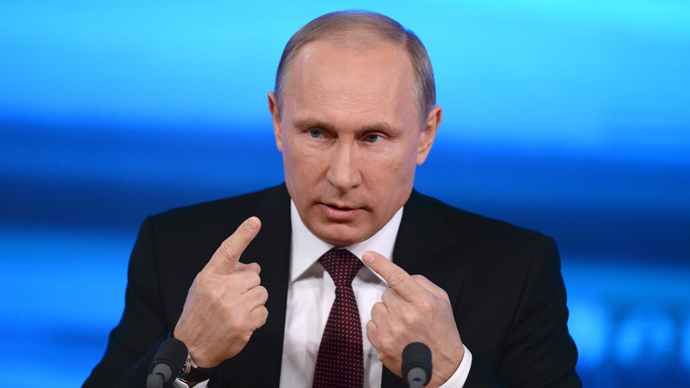 Putin said the loan was made to “support the people of Ukraine, not the government”. Russia’s promise of aid to Ukraine will be fulfilled, but Economic Development Minister Aleksey Ulyukaev said on Wednesday he wasn’t able to say exactly when. First Deputy Prime Minister Igor Shuvalov, who accompanied Putin to Brussels, agrees they need to wait until their is stability within the government. "Our commitment to fulfilling these obligations has been confirmed. As for the schedule and parameters, this is an issue that requires further discussion with our Ukrainian colleagues and consideration of the restructuring of the government," Ulyukaev said. The first $3 billion in Eurobonds were placed at the end of 2013 on the Irish Stock Exchange and facilitated by VTB, Russia’s second largest bank. 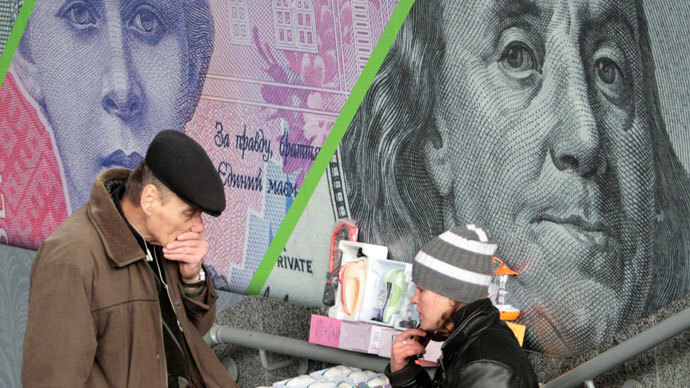 A total of $15 billion was promised to help buffer Ukraine’s dire economic situation, and bonds will be in circulation through January 1,2016. 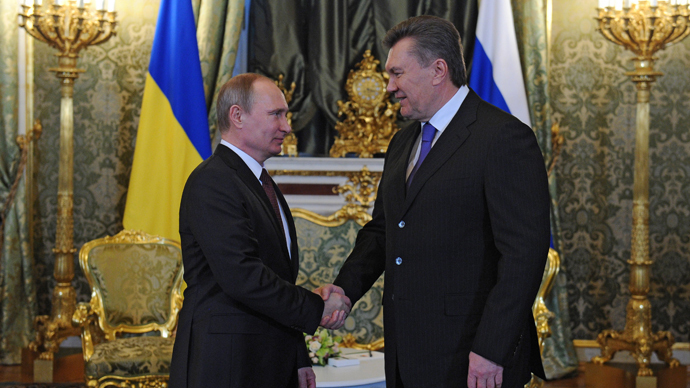 December, when the protests in Kiev were much larger but far less violent, Ukrainian President Viktor Yanukovich traveled to Moscow where he secured a $15 billion loan and a 33 percent discount for natural gas, which could save the country $7 billion in billion in 2014. 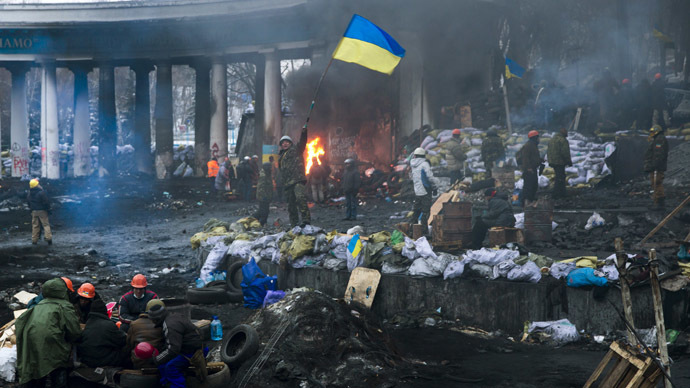 The deal was hailed by then-Prime Minister Azarov as saving Ukraine from economic ruin. Protests in Kiev were set off in November when Ukraine backed out of a trade negotiation deal with the EU in favor of a debt deal with Russia, a move interpreted by Ukrainians as a decisive step away from integration with the EU. 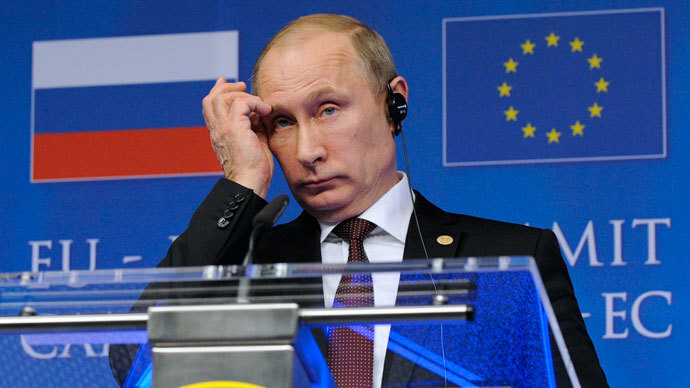 The ideological tug-of-war has involved Russia, the EU, and the US. The US is preparing financial sanctions against Ukrainian officials and protest leaders, which would be imposed if violence escalates in the country, Reuters reports citing congressional aides. The final details of the sanctions are yet to be detailed, but they could be implemented quickly, the sources told the news agency. The US House Foreign Affairs Committee on Wednesday passed a resolution calling on all parties in the Ukrainian confrontation to refrain from violence and work toward a peaceful resolution.